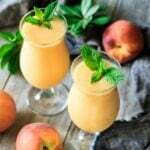 A refreshing non alcoholic summer drink, virgin peach daiquiri is the perfect treat for kids, teens, and adults. This easy mocktail is made with fresh peaches, simple syrup, rum extract, and ice, plus a garnish of mint. It’s a great way to enjoy fresh peaches while they’re in season! Now that it’s June, it’s peach season here in Georgia. Fresh-from-the-orchard peaches? They’re definitely one of the most delicious summer fruits. They have such an incredible fragrance and delightful sweet juicy flavor. 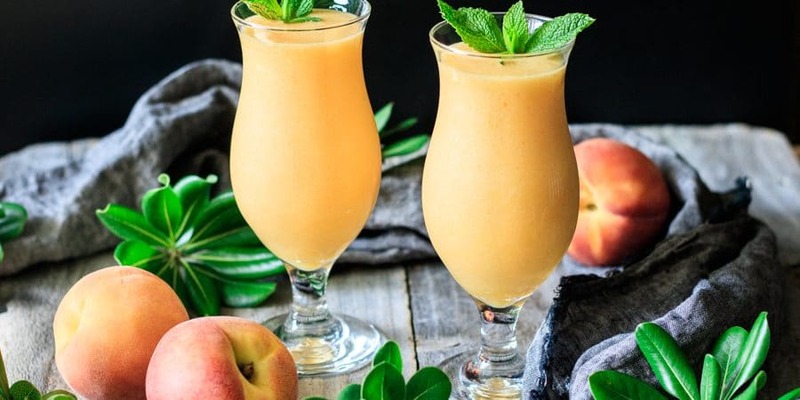 🍑 Making this fresh produce into a virgin peach daiquiri seems like a fantastic idea! Cut up the peaches. If you’re using fresh peaches like I did, make sure to peel them first. Puree the peaches. This makes life easier if you don’t have a really powerful blender. Stir in the simple syrup, lemon juice, and rum extract. Give it a good mix! Blend in the ice. Do this in two batches if you don’t have a powerful blender. Garnish with fresh mint and enjoy! This is the best part, right? Peeling peaches isn’t hard, but just make sure to pick the method that best suits your peaches. If you have quite soft, fully ripe peaches, blanch them. Cut a shallow X in the skin on the pointed end of the peach. 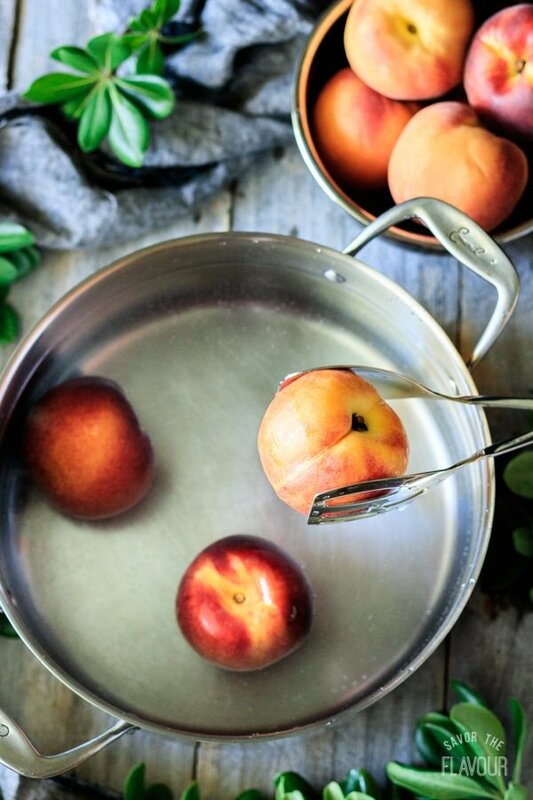 Submerge the peaches in boiling water for 40-60 seconds. 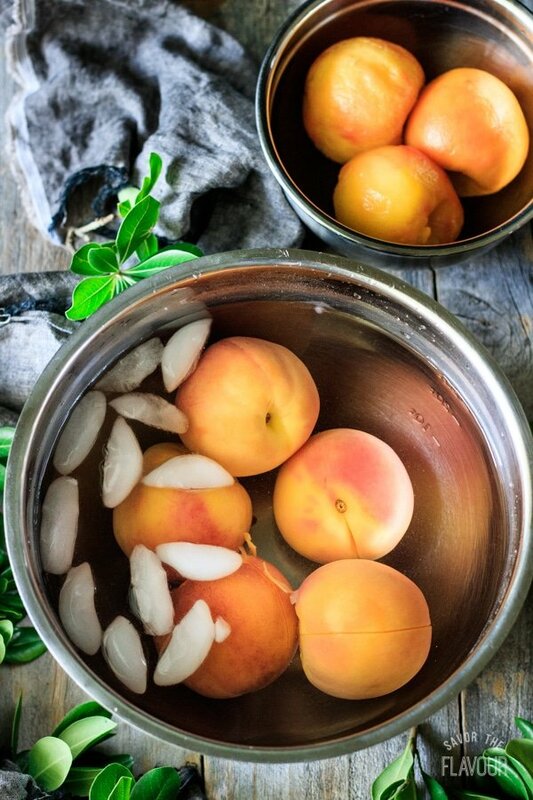 Immediately transfer the peaches to a bowl of ice water to cool. Slowly peel off the skins; they should come off easily. If the skins don’t come off easily, that means the peaches weren’t ripe enough for this method to work. 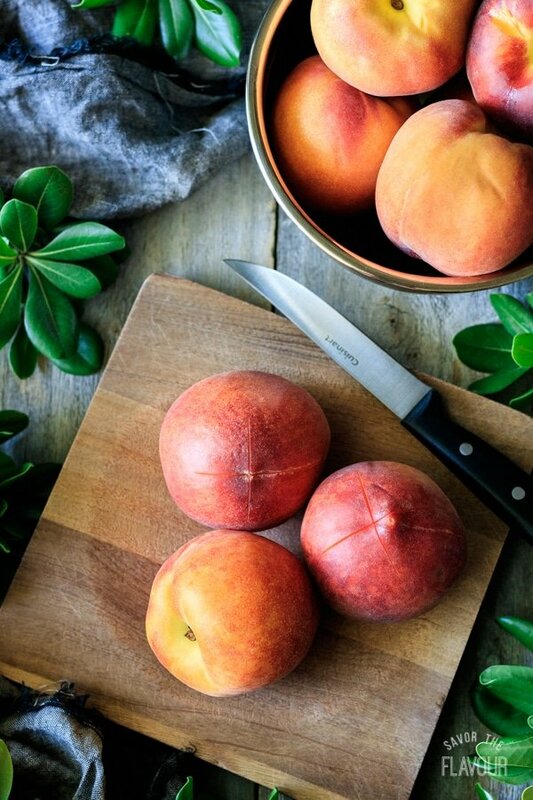 If you have mostly ripe, but firm peaches, cut off the peels with a paring knife or veggie peeler. A few delicious ingredients is all it takes to make this virgin peach daiquiri. Why don’t you give it a try? You’ll want to try these other delicious drink recipes, too! 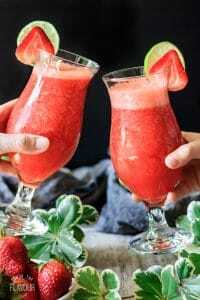 The Best Virgin Strawberry Daiquiri You’ll Ever Taste: fresh and frozen strawberries give this easy drink a wonderful flavor. 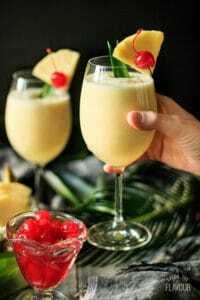 Non Alcoholic Piña Colada: go on vacation to the tropics with one sip of this sweet, creamy drink. Watermelon Slushie Mocktail: a refreshing blend of frozen watermelon and zesty lime juice. Did you make this virgin peach daiquiri? We’d love it if you could leave a recipe rating and share how you liked it. Rinse about 8 large peaches, then peel them. If the peaches aren’t very soft, peel them with a vegetable peeler or paring knife. 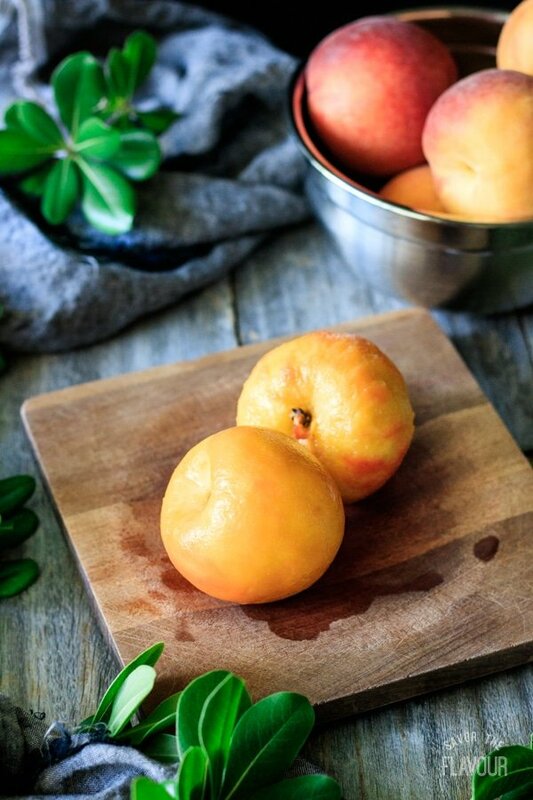 However, if they are very soft and ripe, cut a shallow X at the pointed end of each peach and submerge them in boiling water for 40-60 seconds, then place in an ice water bath to cool. The skin should peel off easily. Cut the peaches by slicing them in half, then twisting or pulling the two halves apart. Pull or cut out the pit, then cut each peach into 8 slices. Cut each slice into 4-5 smaller chunks. Measure out 6 cups of diced peaches (1.05 kg). Puree the peaches 1 cup at a time. 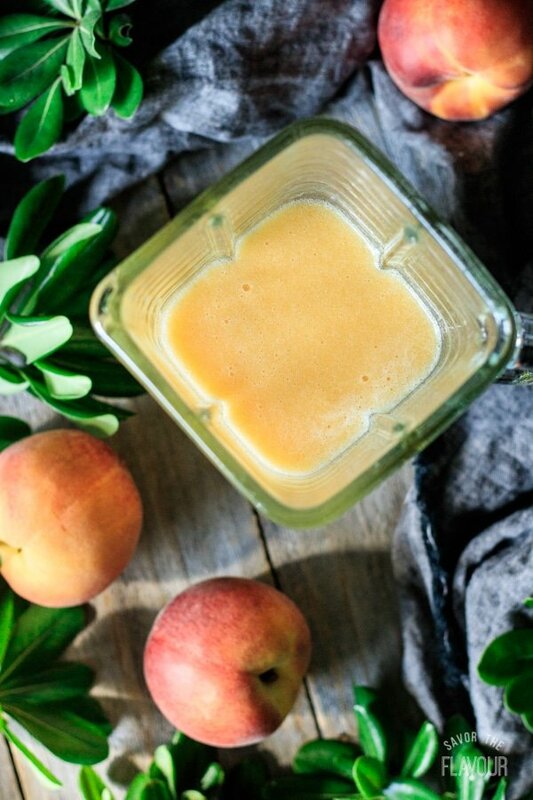 You should have about 4 cups of peach puree. 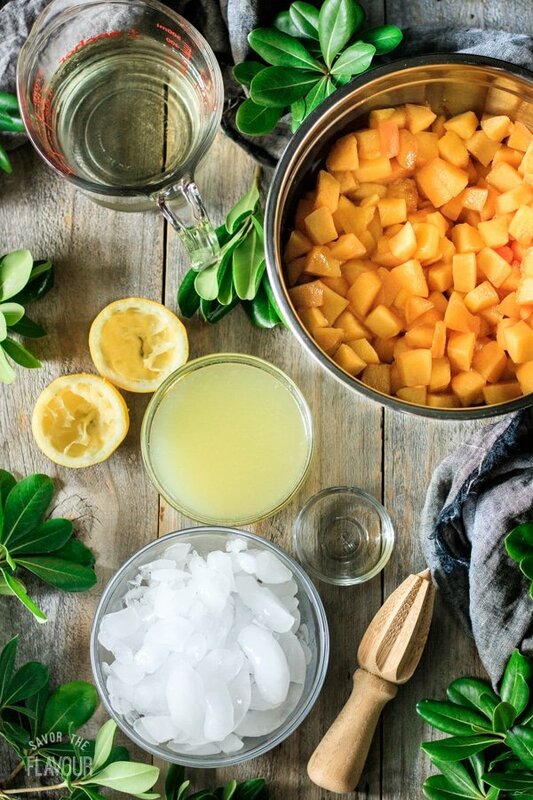 Stir together the peach puree, simple syrup, lemon juice, and rum extract in a large pitcher; then pour 2 cups of the mixture into the blender. Gradually blend in half of the crushed ice, then divide the daiquiri among four 12-ounce hurricane glasses. Repeat with the remaining peach mixture and crushed ice. Serve the daiquiris immediately with a sprig of fresh mint. It’s super easy to make your own simple syrup. Stir together 1 cup of granulated sugar and 1 cup of filtered water in a small saucepan set over medium heat until the sugar is fully dissolved. Chill until cool. 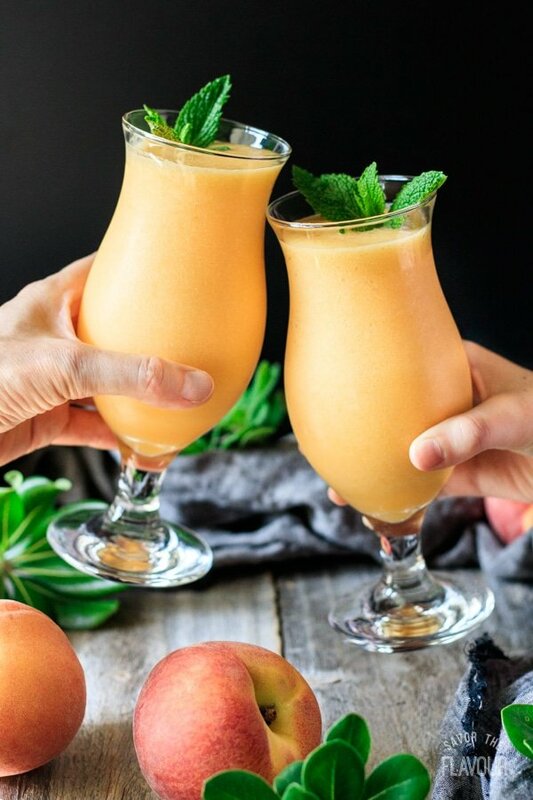 For a frozen daiquiri, freeze the peeled and diced fresh peaches on a cookie sheet for a few hours, then blend with the remaining ingredients except the fresh mint.